Being stuck inside all last weekend because of the rain was the perfect opportunity to make sushi, something I’ve been wanting to try for a while. 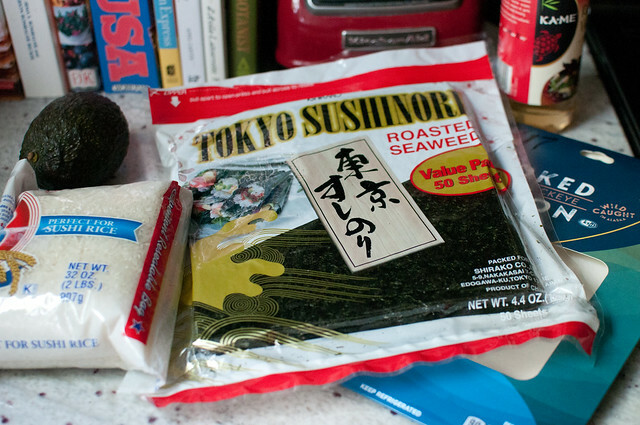 I purchased many of the supplies at Streets Market in Del Ray — they have a great selection of Asian ingredients. 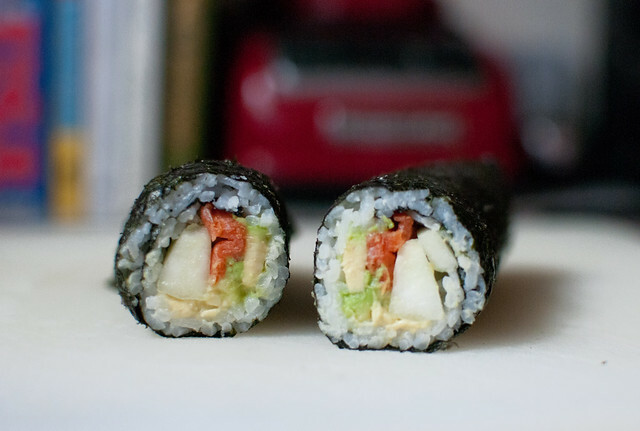 And to make the sushi even easier to roll, I put the nori on the outside. For my sushi, I cooked 1 1/2 cups of dry sushi rice (yield 4 cups cooked). 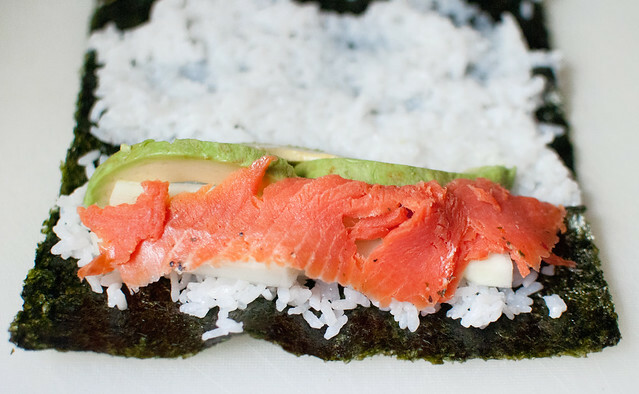 While the rice cooked (about 20 minutes) I peeled and sliced half a cucumber, half an avocado and about two ounces of smoked salmon. When the rice the done and cooled, I added about 1 T of rice wine vinegar for added seasoning. 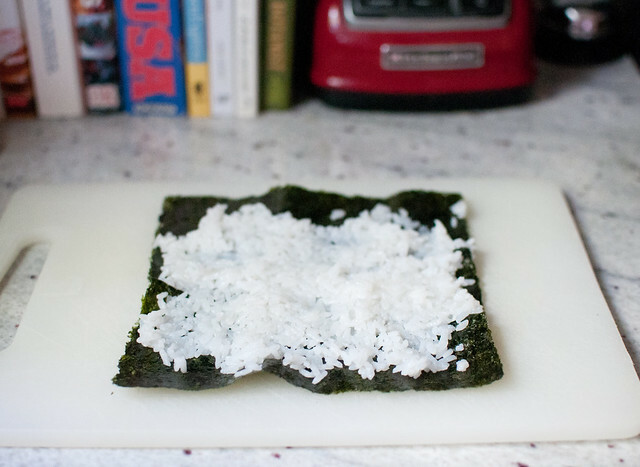 To assemble the sushi, I placed one sheet of nori on a cutting board and spread about 3/4 cup cooked rice, leaving about an inch at the top. Then, I added a few strips of cucumber, avocado and salmon about an inch from the bottom. You don’t want to over pack your sushi or else it will fall apart when you cut it and be difficult to eat. Since I didn’t have a proper bamboo rolling mat, I made sure to roll the sushi as tightly as possible. Using a very sharp knife, I carefully sliced the roll in half. 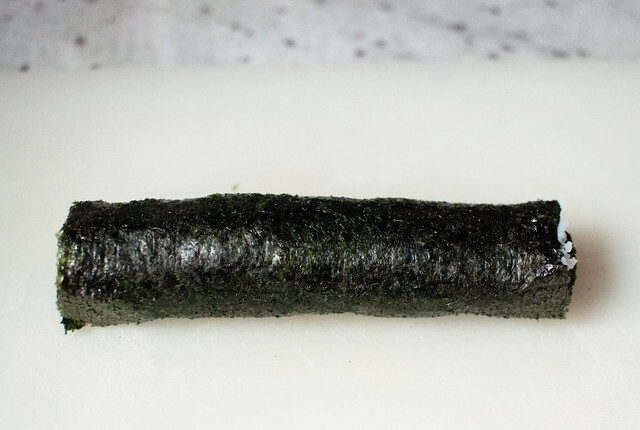 The nori is pretty tough so you need to have a super sharp knife to avoid flattening out your roll. Next, I sliced each half into three pieces, trimming off the jagged ends. It was delicious on its own or dipped in sauce. Not too bad for a first try at sushi. I will definitely be making more in the hot summer months. 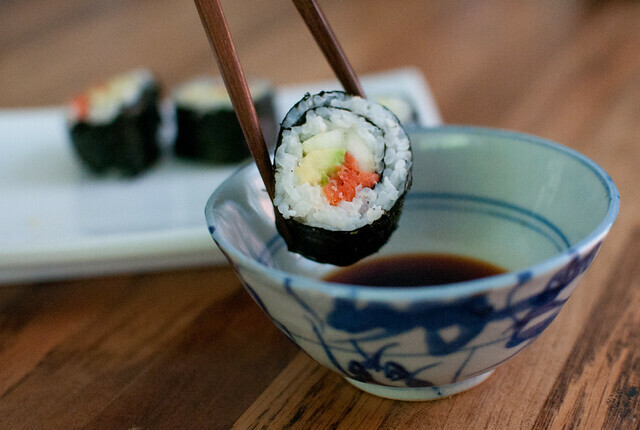 If you have any favorite sushi roll ingredients or tips to share, we’d love to hear from you! 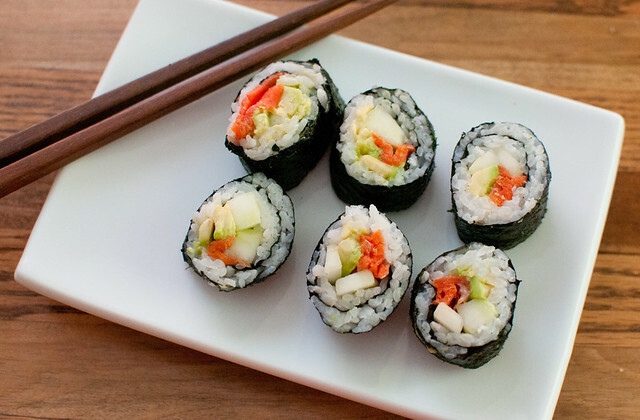 You may also want to try “candy sushi” which Leslie made one summer during Camp Del Ray.